Sunday 30th March 2014 – 11.00pm – John Hawker. 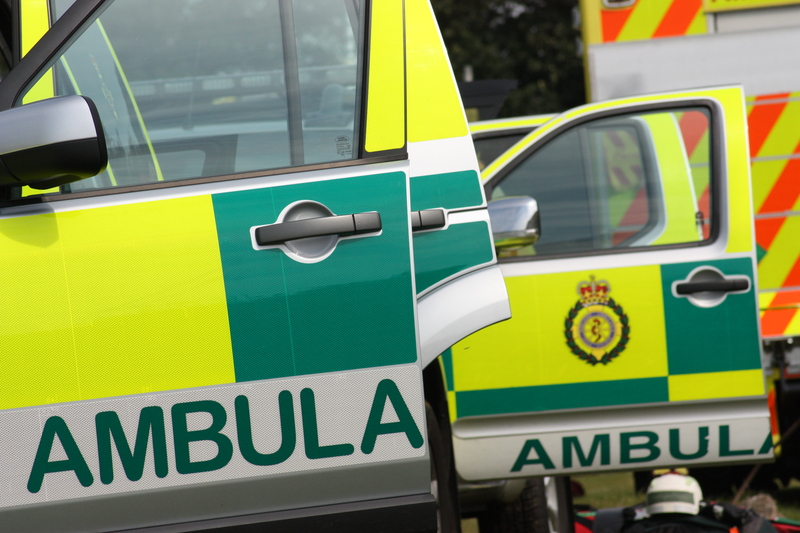 A motorcyclist has been seriously injured following a crash in Shropshire this lunch time. The crash occurred on the B5063, near to Ditches Hall, Wem, at around 12.20pm. An ambulance, a rapid response vehicle and the Midlands Air Ambulance from Cosford attended the scene. A West Midlands Ambulance Service spokesman said: “Crews arrived to find a motorcyclist that had come off his machine and come to rest in the road. “The man, believed to be in his mid 40’s, had suffered serious neck injuries and also chest and minor head injuries. “The man received emergency treatment at the scene by medics and his condition was stabilised. 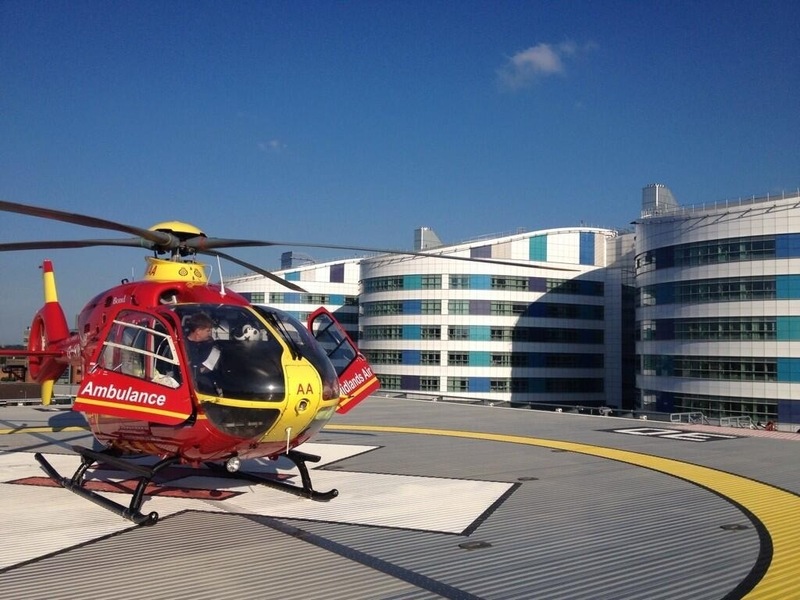 “He was then airlifted to University Hospital North Staffordshire Major Trauma Centre for further emergency treatment. The hospital had been pre alerted and a trauma team were on standby. Saturday 29th March 2014 – 8.00pm – John Hawker. 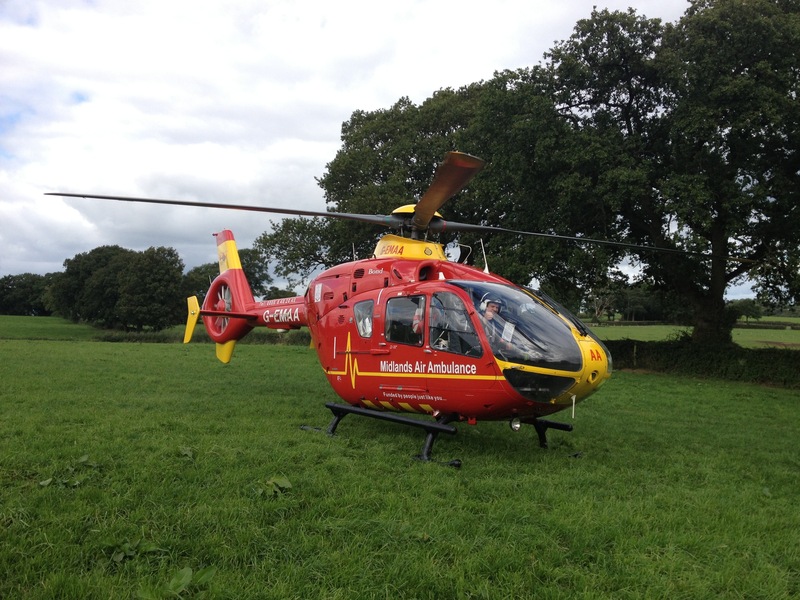 A horse rider has been injured after falling from a horse in Kidderminster this afternoon. The incident occurred in Kinver lane, Caunsall, at around 3.00pm. A rapid response vehicle, an ambulance and the Midlands Air Ambulance from Strensham attended the scene. A West Midlands Ambulance Service spokesman said: “Crews arrived to find an 18 year old girl that had fallen from a horse she was riding. It is believed the horse then rolled over the girl. Friday 28th March 2014 – 5.40pm – Murray MacGregor. 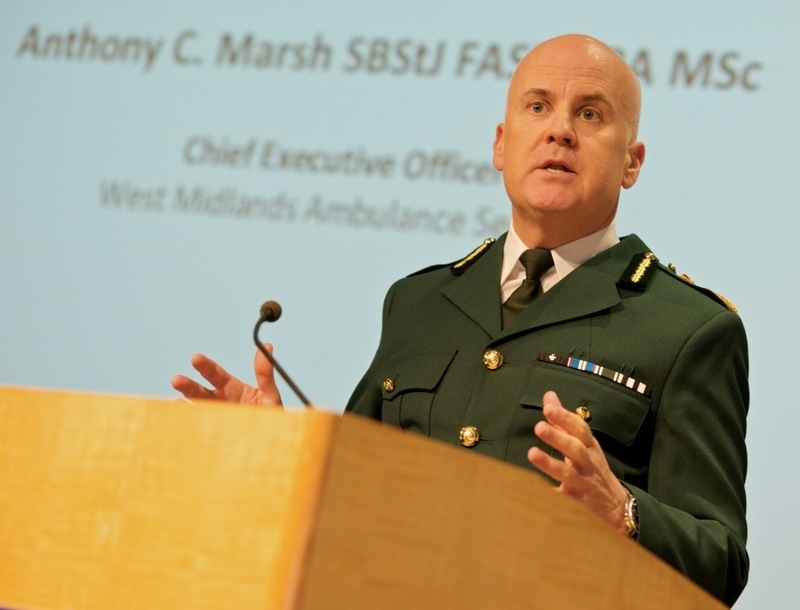 Those are the words of West Midlands Ambulance Service Chief Executive Anthony Marsh on finding out he has been named as one of the Top 50 NHS Chief Executives by the Health Service Journal. Described by the leading health publication as ‘innovative and influential’, Mr Marsh is among a list of the top leaders in the NHS. Leadership Academy; Jeremy Taylor, Chief Executive of National Voices; Peter Carter, Chief Executive of the Royal College of Nursing; and Niall Dickson, Chief Executive of the General Medical Council. In an extensive ambulance career beginning in non-emergency patient transport services over 25 years ago, Mr Marsh has held a number of senior posts and is currently the Chair of the Association of Ambulance Chief Executives and National Ambulance Advisor to the Department of Health. Most recently, he received a Queen’s Ambulance Service Medal in Her Majesty’s New Year’s Honours. Following the announcement today (Friday), Mr Marsh said: “I am very touched and flattered to have been chosen by such an expert panel and to be ranked alongside some fantastic colleagues across the country. “Whilst it is a humbling experience and I am obviously very proud, this award is a reflection on the hard work of all of the staff who work with me in the West Midlands, whatever their role within the organisation. Friday 28th March 2014 – 3.30pm – Jamie Arrowsmith. A man has been airlifted to hospital following a petrol-fuelled explosion in Telford this morning. West Midlands Ambulance Service was called to Pembroke Drive in Wellington at 11.30am this morning (Friday). An ambulance, a rapid response vehicle and the Midlands Air Ambulance from Cosford with a MERIT trauma doctor on board attended the scene. A West Midlands Ambulance Service spokesman said: “The man, believed to be 30-years-old, had reportedly been working on his motorbike when the explosion happened. “Upon assessment, ambulance staff and the doctor found he had suffered burns to his face, hands and left leg, amounting to approximately ten per cent burns. “He was given pain relief on scene before having his injuries treated and dressed. Thursday 27th March 2014 – 4.15pm – Claire Brown. A 35ft tall tree has left a man in hospital after it fell on top of him in his back garden in Cradley Heath this morning. West Midlands Ambulance Service was called to Greenfield Avenue in Cradley Heath shortly before 11.00am this morning (Thursday). An ambulance, a paramedic area support officer and the Midlands Air Ambulance from Cosford with a MERIT trauma doctor on board attended the scene. A West Midlands Ambulance Service spokeswoman said: “The man had reportedly been cutting down the tree when it landed on top of him. A neighbour quickly pulled the man from beneath the tree and, when crews arrived, he was lying on the floor in pain. “Upon assessment, ambulance staff and the doctor found he had left sided pain in his pelvis, back, lower abdomen and neck. He was given pain relief before being immobilised with a neck collar, spinal board and pelvic splint. Wednesday 26th March 2014 – 4.00pm – Suzie Fothergill. Two men have been injured, one seriously, following a road traffic collision in Hereford today. West Midlands Ambulance Service was called to the incident near to the junction of the A4110 and the A4103 shortly before 12.55pm this afternoon. An ambulance, a rapid response vehicle, a paramedic area support officer and two Midlands Air Ambulances were dispatched to the scene. A West Midlands Ambulance Service spokeswoman said: “On arrival at the scene crews found two cars that had been in a significant collision. “The driver of the first vehicle was trapped in his car and had sustained serious multiple injuries. Ambulance crews worked closely with the fire service for approximately 40 minutes to safely extricate the man from the car. 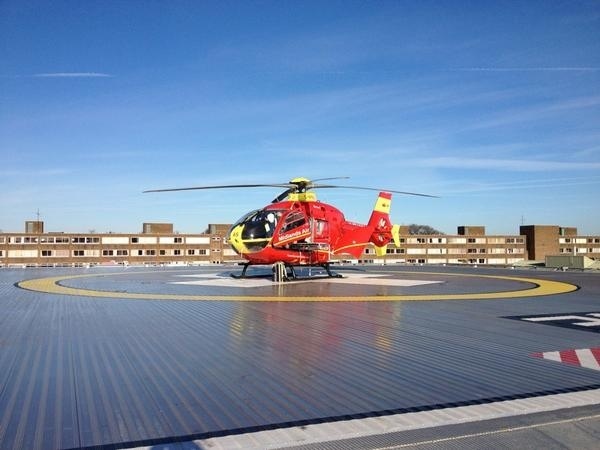 “Due to the nature of the driver’s injuries, the trauma doctor from the Air Ambulance gave the man an anaesthetic at the scene before he was airlifted to the major trauma centre at University Hospital Birmingham for further assessment and specialist treatment. “The hospital was pre-alerted and medics were on standby awaiting their arrival. Wednesday 26th March 2014 – 7.30am – John Hawker. 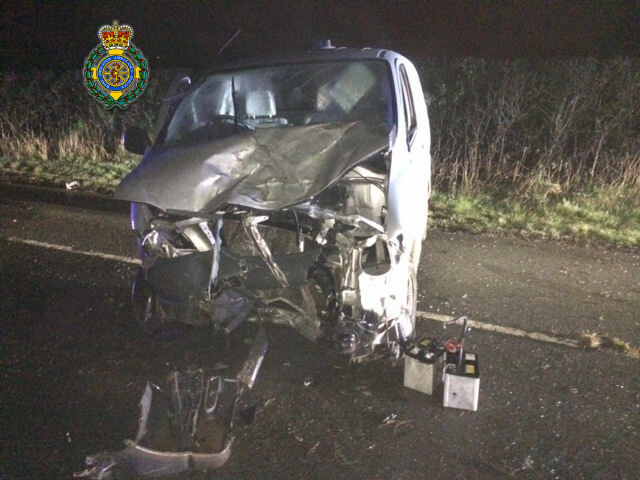 A van driver has been injured following an RTC in Warwickshire last night. The crash occurred on Wolverton Road, Wolverton, near Norton Lindsey at around 9.20pm. An ambulance, a rapid response vehicle, a paramedic officer and the Trusts MERIT team attended the scene. A West Midlands Ambulance Service spokesman said: “Crews arrived to find a van that is believed to have been in collision with a tree, overturned and come to rest back on its wheels. The driver of the van had been ejected from the vehicle in the crash and was on the road being cared for by a passer-by. “The man, believed to be in his early 40’s, suffered serious arm injuries, back injuries and multiple abrasions to his head and face. He received emergency treatment at the scene by medics including receiving pain relief. “Once the man’s condition was stabilised, he was transferred by ambulance to University Hospital Coventry and Warwickshire for further emergency treatment. Monday 24th March 2014 – 3.55pm – Chris Kowalik. Two women have been taken to hospital following a three car collision in Walsall. West Midlands Ambulance Service was called to Broadway shortly after 1pm today. Three ambulance crews, a paramedic area support officer in a rapid response vehicle and the Midlands Air Ambulance from Staffordshire attended. A West Midlands Ambulance Service spokesman said: “The driver of one of the cars, a woman in her thirties, had to be cut free from her vehicle. She had leg pain for which was intravenously given pain relief. She was removed from the car on a spinal board and was taken by land ambulance to Sandwell Hospital. Her injuries aren’t believed to be serious. Monday 24th March 2014 – 3pm – Chris Kowalik. A man in his seventies has suffered a head injury in a collision with a bus in Dudley. West Midlands Ambulance Service was called to King Street shortly before 1.15pm today. Two ambulance crews, a paramedic area support officer in a rapid response vehicle and the Midlands Air Ambulance from Cosford attended. A trauma doctor is part of the crew on board the air ambulance. A West Midlands Ambulance Service spokesman said: “The pedestrian had an isolated serious head injury and tenderness to his abdomen. His condition was stabilised at the scene. He was also anaesthetised at the scene and his airway maintained. Monday 24th March 2014 – 2.10pm – Chris Kowalik. Four people, two of them young children, have been injured in a collision involving two cars in south Warwickshire. West Midlands Ambulance Service was called to the junction of Fosse Way and the B4455 at Ettington shortly after 10.20am today. An advanced community paramedic in a rapid response vehicle, a paramedic area support officer in a rapid response vehicle, three ambulances and the Warwickshire and Northamptonshire Air Ambulance attended. A West Midlands Ambulance Service spokesman said: “The driver of one of the cars, a woman in her thirties, had pelvic and chest injuries. A pelvic bind was applied, she was fully immobilised and given pain relief before being flown to University Hospital Coventry and Warwickshire. “In the same car were two young girls both of whom had suspected head injuries. They were both stabilised at the scene and were taken to the same hospital in land ambulances. Monday 24th March 2014 – 12pm – Chris Kowalik. A paramedic attending a road traffic collision involving a cyclist in Staffordshire has remarked on the effectiveness of cycle helmets. West Midlands Ambulance Service was called to reports of a collision involving a pushbike and a car at the junction of the A460 and Bognop Road, Essington, shortly before 8.15am today. A paramedic in a rapid response vehicle, a paramedic area support officer in a rapid response vehicle and an ambulance crew attended. A West Midlands Ambulance Service spokesman said: “The cyclist, a man in his forties, had chest and leg injuries. 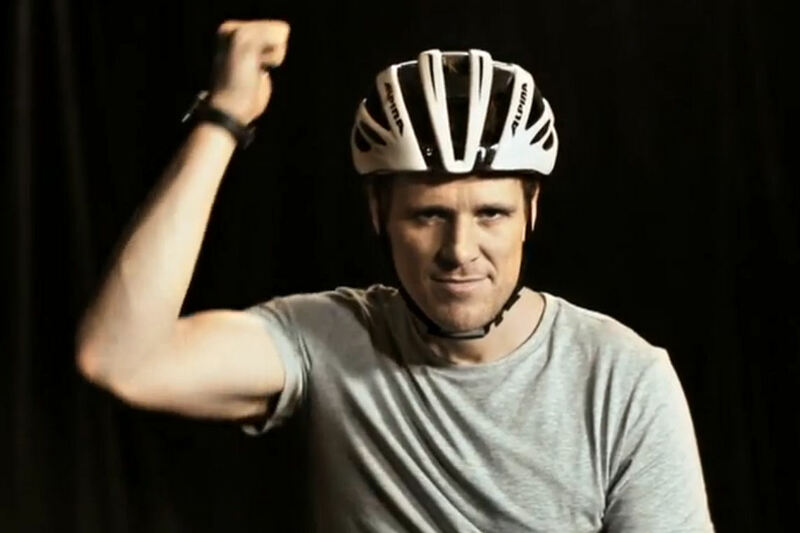 “He was wearing a cycle helmet. One of the attending crew remarked how, considering how little such helmets weight, how effective they are at saving someone where there is an impact. Sunday 23rd March 2014 – 8.05pm – Chris Kowalik. A man out walking along a bridle path with his girlfriend hit his head on a bridge, but because neither of them knew exactly where they were, a detailed search for them began. West Midlands Ambulance Service was initially called to the described location of near a bridge off Coventry Road, Cubbington in Warwickshire at 9.05am today. The man had reported felt drowsy, had difficulty breathing and was nauseous. A paramedic in a rapid response vehicle headed there first and, on arrival, got out of the car and began searching on foot. He found the patient’s girlfriend who then tried to show him where her partner may have been. 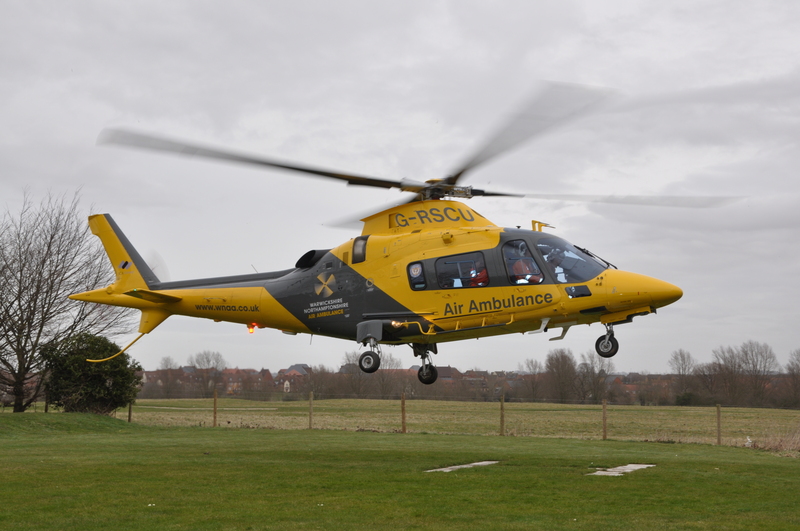 The Warwickshire and Northamptonshire Air Ambulance was dispatched. West Midlands Ambulance Service’s control room was speaking to the patient, a man in his twenties, on the phone and told him to make himself known when he saw the helicopter flying overhead. The control room stayed on the line until the helicopter arrived. Sunday 23rd March 2014 – 8pm – Chris Kowalik. 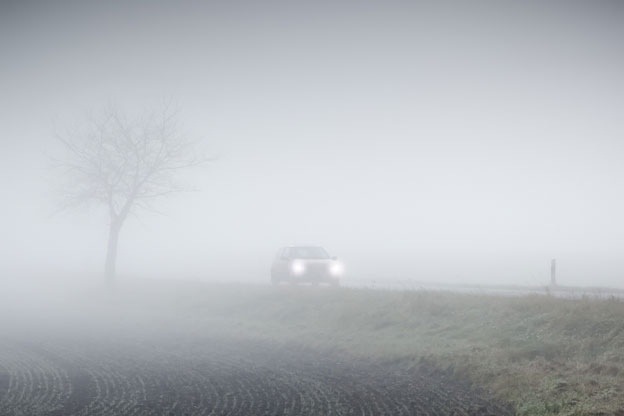 A woman driver whose car left a road and went up an embankment, has suffered back pain. 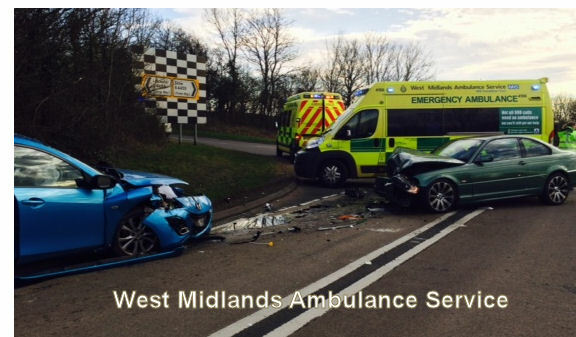 West Midlands Ambulance Service was called to the A500 at its junction with the A34 at Talke at 3.45pm today. Two BASICS emergency doctors, a paramedic area support officer and an ambulance crew attended. A West Midlands Ambulance Service spokesman said: “The car she was driving left the A500 and went up a bank through some trees. There was significant damage to the car. “Its driver, a woman in her twenties, had lower back pain. The fire service cut off the car’s roof and she was removed from the vehicle on a spinal board. Sunday 23rd March 2014 – 7.10pm – Jamie Arrowsmith. A man has died following a road traffic collision on the M40 in the early hours of this morning (Sunday). West Midlands Ambulance Service was called to the M40 southbound, between junctions 12 and 11, at approximately 4.55am. An ambulance, a paramedic area support officer and the MERIT trauma team were dispatched to the scene. A West Midlands Ambulance Service spokesman said: “Crews were called to reports of a car and a man that had been in collision. “The man had suffered multiple injuries and advanced life support was carried out at the scene by medics. We have no further details regarding this incident. Saturday 22nd March 2014 – 6pm – Jamie Arrowsmith. A woman suffered facial injuries and had to be taken to hospital after colliding with a tree whilst horse riding in Kidderminster earlier today (Saturday). West Midlands Ambulance Service was called to the incident at Bissell Wood Equestrian Centre at 1.05pm this afternoon and sent an ambulance, a community paramedic officer and the Hazardous Area Response Team to the scene. A West Midlands Ambulance Service spokesman said: “Due to the woodland location, crews had to leave the ambulance at the roadside and complete their journey to the patient on foot. “On arrival, crews found a woman, believed to be 30-years-old, who had collided with a tree whilst horse riding. “She was assessed and treated on scene for a suspected fractured jaw and broken teeth. For pictures, please visit: www.flickr.com/photos/officialwmas . Left click on the appropriate thumbnail image to reveal a full-size picture. In the right-hand column, click on the “three dots” icon. Please credit “West Midlands Ambulance Service” if using them. Friday 21st March 2013 – 3pm – Chris Kowalik. 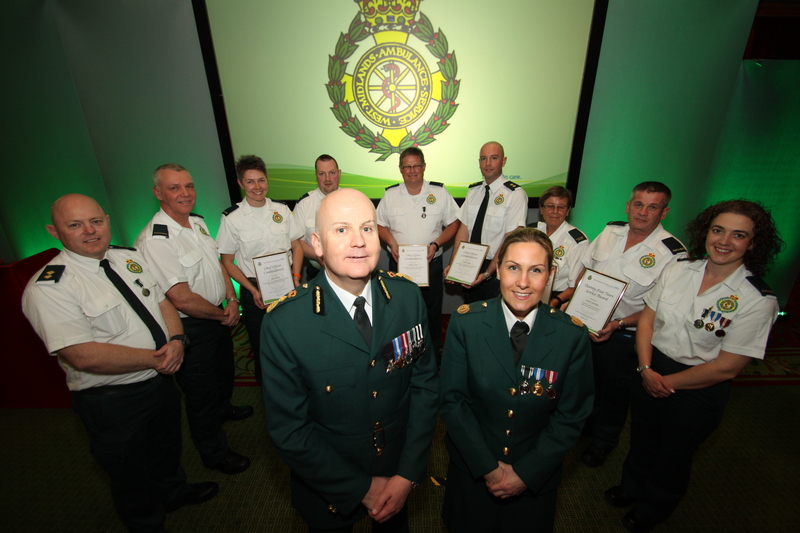 Staff of West Midlands Ambulance Service, volunteers and members of the public have been honoured at a ceremony in Staffordshire for their help in saving lives. Chief Officer Commendations were awarded at the Long Service and Excellence Awards, sponsored by Zoll UK Ltd. at the Best Western PLUS Stoke-on-Trent Moat House on Thursday 20th March during which members of ambulance service staff received awards for long service and good conduct and retirement certificates. This year, more than fifty operational members of staff became eligible for their 20 year Long Service and Good Conduct Medal. The combined years of service of all those eligible for 20, 25 and 30 year Long Service Awards totalled more than 2,700 years. Shirley Walker was a front seat passenger in a car travelling through central Birmingham when it was involved in a collision with a pedestrian. The collision resulted in the pedestrian actually going through the windscreen and ending up head-first into the car itself. Even though Shirley was in severe shock, she bravely managed to hold the pedestrian’s airway open for the length of time it took the medical crews to arrive. The selfless actions demonstrated by Shirley in the most traumatic of situations almost certainly gave the patient a fighting chance of survival and assisted arriving medical teams in the treatment of the patient. In April last year Phoebe was playing in her back garden when she became entangled in the rope of a swing. The alarm was raised by her brothers William and John who alerted their mother to the unfolding emergency. They dialled 999 and stayed on the telephone until help arrived. They then directed ambulance crews straight to Phoebe. The crews immediately carried out resuscitation and rapidly transferred Phoebe to hospital. Pheobe has made an excellent recovery and attended the ceremony with her two brothers, parents Bruce and Kate and members of the emergency team who went to her assistance. 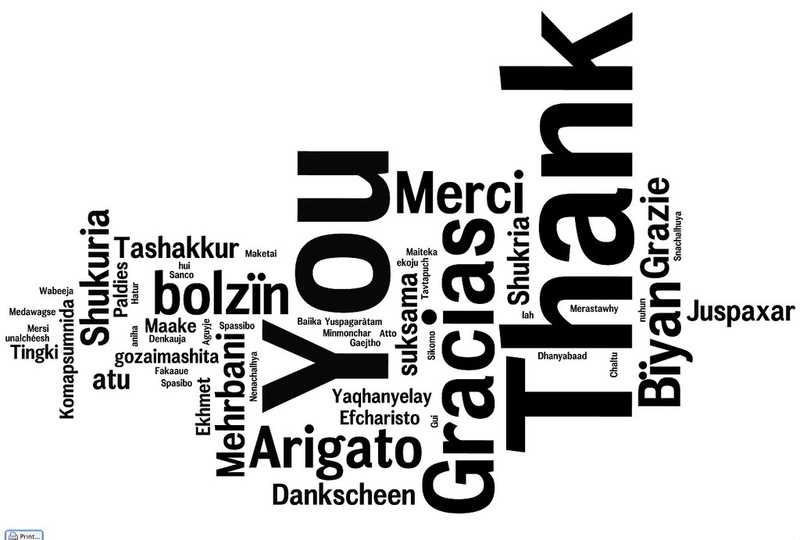 Ambulance crews are always grateful to bystanders and members of the public who alert and assist them at the scene of 999 calls. Three children made it their business to alert the ambulance service by calling 999 to report the sudden collapse of their father. They spoke to the Emergency Operations Centre and stayed on the phone explaining the situation until help arrived. They then operated the security door of the apartment block to provide access to ambulance staff so they could treat the patient who was suffering serious breathing problems. Mr Cooke was treated by ambulance staff before being taken to hospital where he has since made a good recovery and was able to attend the ceremony. Amber, Chelsey and Cory Cook received the Chief Officer Commendation for their excellent work. In April last year, CFR volunteer Mandy Tuckley was enjoying a family meal at a pub near Walsall when she heard a commotion after a woman called out that someone had stopped breathing. Mandy immediately went to investigate and found someone holding a young girl who was unresponsive. With an ambulance already on its way, Mandy followed her training and found that the young girl had gone all floppy and then stopped breathing. She began immediate treatment and quickly saw the patient start to breathe on her own again. The two-year old was found to have glandular fever with a very high temperature. Thankfully, the child went onto make a full recovery. Mandy was awarded a Chief Officer Commendation for her quick response at the scene. Being sent to a serious road accident is always a stressful business. But coming across an incident with no prior knowledge will certainly increase those stress levels. Such was the case in Oldbury when a crew and rapid response car happened to come across an incident at the same time. The crews had no time to get mentally adjusted for what they were about to deal with. Sadly it was a serious accident and the crews immediately went into action to recover two elderly patients from a car and start resuscitation and advanced life support before more crews arrived on scene. For his actions in what was an extremely difficult situation, the Chief Officer presented a commendation to Chris Harte. His colleagues were unable to attend the ceremony. On one of the hottest days of the year last August, an ambulance crew and a paramedic in a rapid response vehicle were sent to an incident near Hereford railway station. Crews arrived to find a man had fallen under a train and was suffering from serious multiple injuries. Temperatures were reaching the mid 30s as the team climbed down onto the track and began treating the man who was still partially underneath the train. Despite the man’s extensive injuries the crew managed to use all their skill and expertise to stabilise him before carrying him to a place of safety. Kate and Mark were awarded Chief Officer Commendations for treating a seriously injured patient in a confined space during extreme temperatures in a dangerous environment. Graham O’Neill and Paul Shorto from Birmingham both demonstrated exceptional bravery and presence of mind when they entered a smoke filled room to locate the patient. Not only did this crew remove the patient to safety and treat him for his injuries, they also managed to ensure the fire was extinguished in his property, thereby helping to protect and safeguard the fire risk to other residents. For their commendable actions, Graham O’Neill and Paul Shorto were presented with a Chief Officer Commendation. Last year, Adam Joynes was sent to the M5 Motorway in Worcestershire following reports that a woman was threatening to jump from a motorway bridge. With no police negotiator on scene at the time of his arrival, Adam decided to strike up a conversation with the woman. So successful was his repartee that a senior police officer suggested he continue his conversation. Eventually Adam persuaded the woman to climb back over the bridge parapet to a place of safety. This exceptional and skilful act demonstrated by Adam prevented a patient suffering serious or life-threatening injuries by jumping from a motorway bridge. He was awarded a Chief Officer Commendation for his professionalism and negotiation skills. Chris Salt was part of an ambulance crew called to a building site in Smethwick last month. The crew arrived to find a workman buried up to his neck in a collapsed trench. The crew could only see his face above ground and immediately dug out enough soil to provide an oxygen supply to the patient and allow him to expand his chest. The danger of a further collapse of the trench, which was 20 feet deep together with an unstable brick wall above them meant they were operating in the most dangerous of locations. Work continued to save the man for almost three hours before the patient was eventually rescued and taken to hospital. For their brave response in treating a patient in the most difficult of situations, the crew were awarded Chief Officer Commendations. Chris’ crew colleague was unable to attend the ceremony. Wayne Carrier, Advanced Emergency Medical Technician based in Worcestershire. In February this year the ambulance crew of Wayne Carrier and his colleague who was unable to attend the awards ceremony were responding to what they thought was a routine call to a woman in labour. When the crew arrived they were confronted by a patient on all fours in breech labour with the leg of the new born presenting. In a frantic attempt to get help, Alex was told by a midwife: “Don’t touch her, just get her into hospital!” With the birth imminent, the patient living in a block of flats and the lift too small for a stretcher, the only option was delivery. With amazing skill, Wayne and his colleague delivered a healthy baby with mum also doing well. Even the arriving community midwives, who had themselves never delivered a breech birth, were full of praise for the crew. Marvis Hancock is responsible for supporting and implementing AEDs in nine locations in the Biddulph area of Staffordshire. All the machines are available for use by the local community. Not only has Marvis taken the time to locate the machines in premises around the area, she has also had a hand in training the community to use them. Marvis received an Outstanding Achievement Award for her exceptional work in the community. Jon Cobb was recognised for his outstanding community work, specifically the development of school education packs, something he has progressed with colleagues in West Midlands Fire Service. Jon has also worked with the National Trust on safety projects and regularly attends schools and fetes in his own time to spread the word. Jon is well respected in his local community for his significant achievements in that area. The ‘running paramedic’ as he is known locally has been fundraising for charities in Staffordshire and elsewhere for many years. Thousands of pounds have been raised in support of good causes. Ray’s efforts have earned him many accolades including one of the few holders of the Queen’s Ambulance Medal which he received at Buckingham Palace last year. 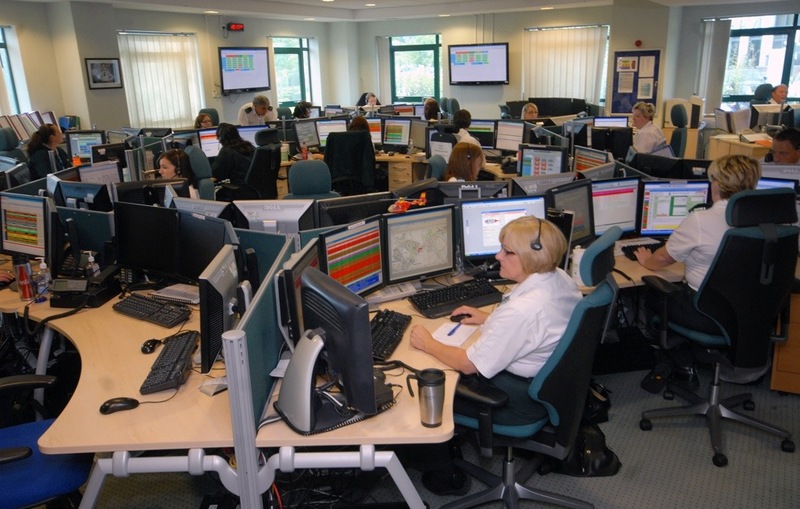 West Midlands Ambulance Service was asked to step-in and provide a NHS 111 call centre service for the majority of the West Midlands after the withdrawal of the previous provider. The team worked exceptionally hard, often above and beyond the scope of their normal duties to get the service back on track before the official takeover in November. They took charge of the facility and helped transform it into an extremely successful patient centred service currently meeting all its targets. With recruitment into the Trust at its highest level for many years, the recruitment team at West Midlands Ambulance Service has been working flat-out over the past twelve months. They placed 250 adverts during the year and dealt with over 11,500 applications, all requiring a thorough review against each job. That compared with over two years ago when 112 adverts gave rise to 3,500 applications. This illustrates the sharp increase in numbers of people interested in working for the Trust. Prof. Mathew Cooke, Warwick Medical School. Around 60,000 patients suffer a cardiac arrest in communities across the UK each year and resuscitation is attempted by the emergency services to approximately half of these patients. The NHS spends approximately £320million a year treating cardiac arrest victims. Despite this significant investment, at present only 1 in 20 people survive hospital and is able to go home after a cardiac arrest. The PARAMEDIC LUCAS TRIAL looked at the use of a new mechanical chest compression device (called LUCAS-2) to improve survival rates and other patient outcomes in victims of cardiac arrest. The PARAMEDIC trial was a collaboration between the Universities of Warwick, Coventry, Leeds, Southampton and Surrey and the North East, South Central, Welsh and West Midlands Ambulance Services. The West Midlands Ambulance Service Partnership Award was presented to the University of Warwick Medical School. Those involved in the Lucas trial from West Midlands Ambulance Service were recognised for their valuable contribution to the project. Note to Editors: A cardiac arrest is not a “heart attack” and should not be referred to as such. Friday 21st March 2014 – 1.30pm– Jamie Arrowsmith. 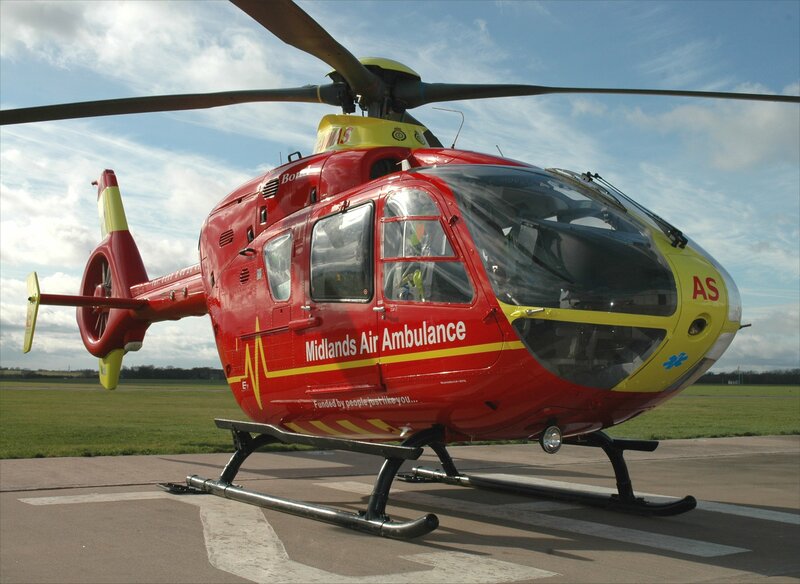 A man has been airlifted to hospital after sustaining several serious injuries in a road traffic incident in Alcester this morning (Friday). West Midlands Ambulance Service was called to reports of a car which had overturned on the A435, outside Ragley Hall, shortly before 9.40am. An ambulance, the Midlands Air Ambulance from Strensham and a Paramedic Area Support Officer attended the scene. A West Midlands Ambulance Service spokesman said: “On arrival, crews discovered a car that had come to rest on its roof and its occupant, a man believed to be in his late 80s, was trapped as a result. “The man suffered suspected chest and pelvic injuries, as well as hip and arm injuries. “Whilst ambulance staff administered pain relief and medical treatment to him, the fire service worked carefully to extricate the man from the vehicle. As a result of the significant damage sustained by the car, it took almost 45 minutes for the man to be cut free. “Once his condition had been stabilised, the man was fully immobilised with a neck collar, spinal board and pelvic splint. He was then carried on a stretcher to the air ambulance, which had landed in a nearby field, before being flown to Queen Elizabeth Hospital Birmingham, for further emergency treatment. 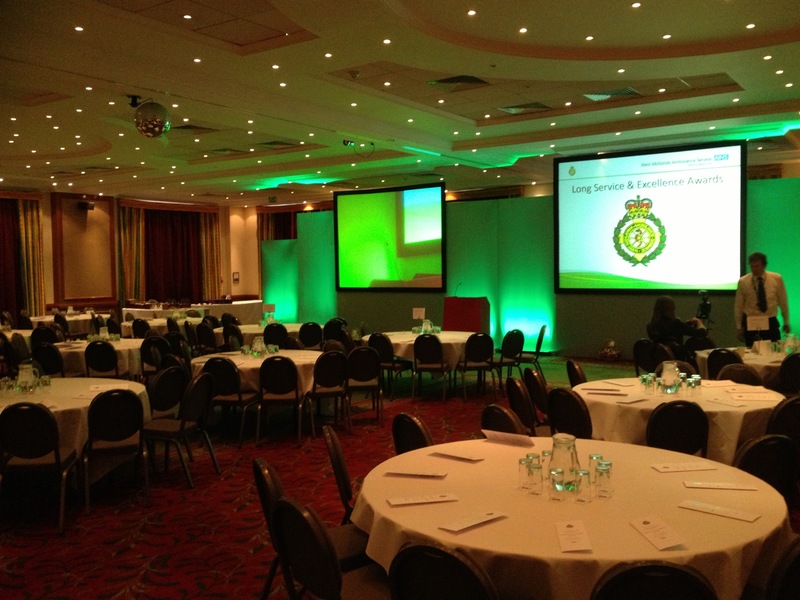 Thank you to all those who attended the WMAS Long Service and Excellence Awards yesterday. Congratulations to all award recipients. Thursday 20th March 2014 – 11.00am – John Hawker. A man has suffered arm and chest injuries after being trapped in machinery at industrial premises in Brierley Hill this morning. The incident occurred at premises on Pedmore Road Industrial Estate at just after 7.00am. An ambulance, a rapid response vehicle, an ambulance officer and the Midlands Air Ambulance from Cosford with a Medic on board attended the scene. A West Midlands Ambulance Service spokesman said: “Crews arrived to find a man in his 20’s who had been trapped in machinery by his arm. “The man received emergency treatment at the scene for his injuries and received pain relief. “The man’s condition was stabilised and he was transferred by land ambulance to the Air Ambulance which had landed at a car park nearby. 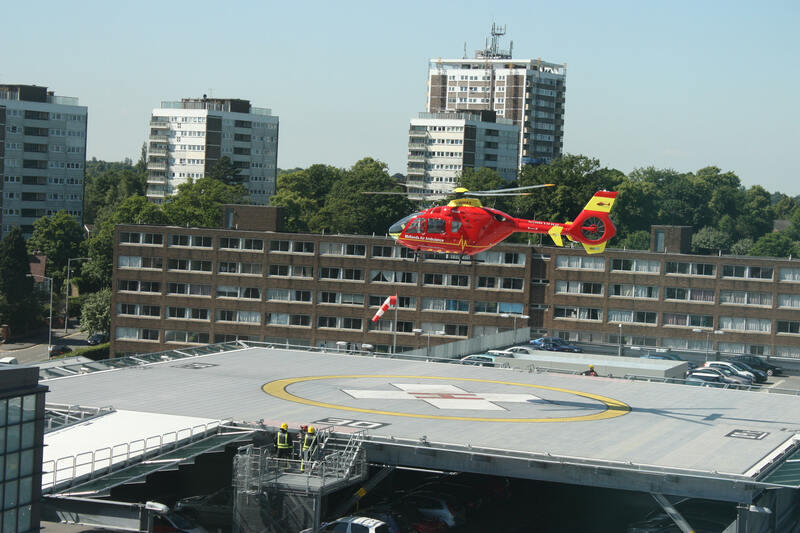 “The man was then airlifted to Queen Elizabeth Hospital Major Trauma unit for further assessment and emergency treatment. Thursday 20th March 2014 – 8.30am – Claire Brown. 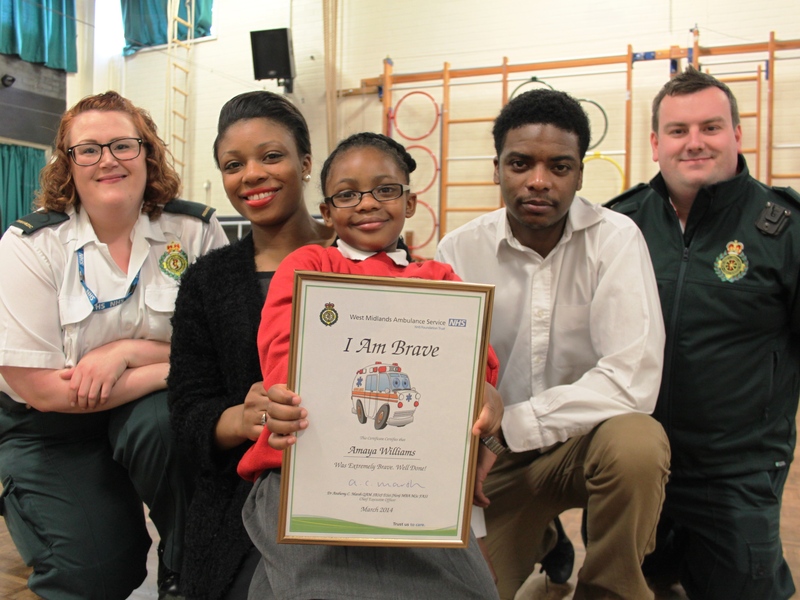 A little girl from West Bromwich, who dialled 999 when her diabetic mum collapsed at home, has been presented with an ambulance service bravery award in her school assembly. Five-year-old Amaya Williams and her mum Shekera Lodge had just got up on the morning of the 15th February when 28-year-old diabetic sufferer Shekera collapsed. Amaya quickly sprang into action and tried to give her mum a sugary drink; something she’d been taught to do from a young age. When this didn’t work, Amaya dialled 999. When West Bromwich based Paramedic Victoria Poole and Emergency Medical Technician Karl Wilkins arrived at the house, they were amazed to be greeted by the little girl who quickly explained that her mum was diabetic. Victoria said: “Before we got there, Amaya had put the family dog in the kitchen out of the way which is a very sensible thing to do as we needed space to work in. Amaya was calm and collected and even helped to make a piece of toast to give to Shekera when she came round from her diabetic episode. Victoria and Karl presented Amaya with a bravery award at Glebefields Primary School in Tipton during the morning’s assembly on Wednesday 19th March. Pictured (left to right): Paramedic Victoria Poole, Mum Shekera Lodge, Amaya Williams, Dad Duane Williams and Technician Karl Wilkins. Audio highlights of the 999 call recording is available to accompany this press release below. Wednesday 19th March 2014 – 11pm – Chris Kowalik. A major search was underway today for a walker who fell hurting her ankle in woodland in Staffordshire. West Midlands Ambulance Service was called to Forest Wood in Quarnford shortly after 2.40pm. 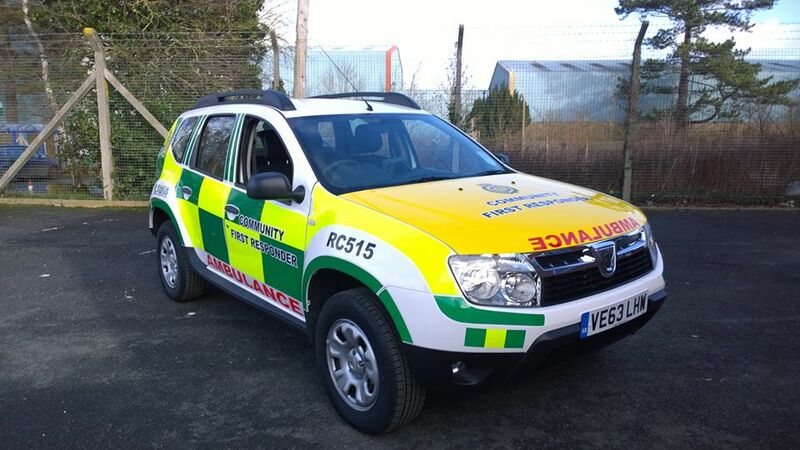 An advanced community paramedic was first to arrive in his rapid response vehicle at the nearest accessible point by car near Gradbach House Farm. With the exact location of the woman unclear, the search for her had continue on foot along a number of tracks. She was found on top of a hill. Members of West Midlands Ambulance Service’s Hazardous Area Response Team and an ambulance crew later joined along with police and mountain rescue. Once found, the woman who is in her sixties was safely taken down to the waiting ambulance and was taken to the University Hospital of North Staffordshire. WMAS welcomes Chancellor’s announcement to drop VAT on fuel for air ambulances and inshore rescue boats. Watch this space. 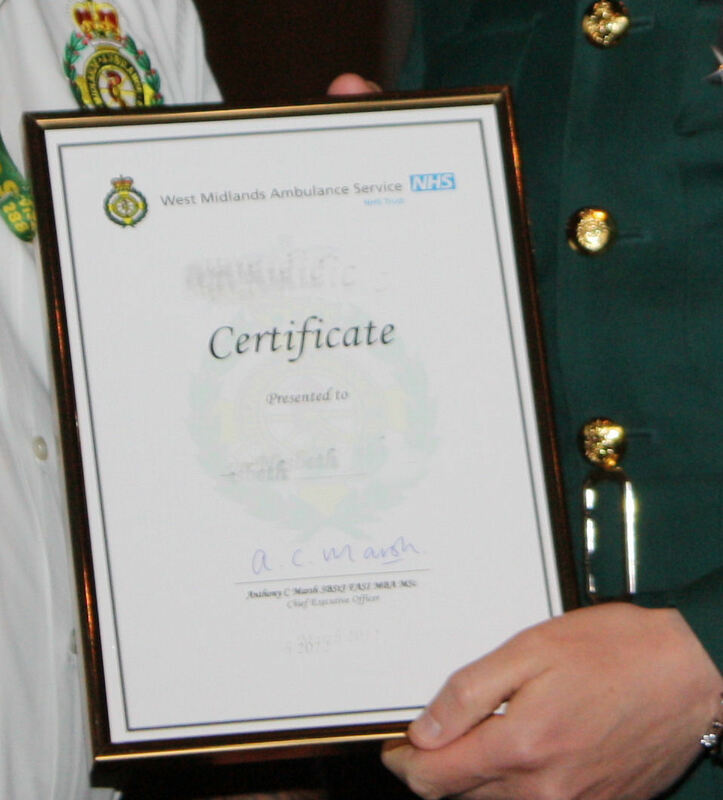 The prestigious WMAS Long Service & Excellence Awards takes place tomorrow afternoon from 4pm in Stoke. Wednesday 19th March 2014 – 10.25am – Chris Kowalik. One of the main routes into and out of Wolverhampton was partially blocked this morning after a lorry jackknifed. It happened on the A41 at Albrighton. West Midlands Ambulance Service was called to the scene shortly before 9am today. Staff from West Midlands Ambulance service have appeared in the third of a three-part television educational documentary series about the care of some of the most seriously ill and injured patients they deal with. ‘An Hour To Save Your Life’, the third and final part of which was broadcast last night on BBC2, explored in forensic detail the dilemmas and innovations at the frontline of emergency medicine. Following the lead clinicians as they respond to the most critical of cases, the series offered a unique insight into the minute-by-minute decisions that are made in the fight for life. Tuesday 18th March 2014 – 5.15pm – John Hawker. A motorcyclist has died following an RTC in Nuneaton this afternoon. The crash occurred on Mancetter Way, near the Anchor Inn public house, at around 1.05pm. An ambulance, a rapid response vehicle, a paramedic officer and the Warwickshire and Northamptonshire Air Ambulance attended the scene. A West Midlands Ambulance Service spokesman said: “Crews arrived to find a motorcyclist that had been in a serious RTC. “The man riding the motorcycle had suffered multiple injuries and advanced life support was carried out at the scene by medics. Tuesday 18th March 2014 – 4.45pm – Jamie Arrowsmith. A woman who was left trapped in her vehicle following a two car collision in Warwickshire this afternoon (Tuesday) has suffered various serious injuries. West Midlands Ambulance service was called to the incident in Birches Lane, Kenilworth shortly before 3pm and sent an ambulance crew and a Paramedic Support Officer to the scene. The collision left both cars with front end damage and the patient trapped in her vehicle for approximately 45 minutes. Ambulance staff worked together with the fire service to extricate the woman whilst continuing to treat her for her injuries. A West Midlands Ambulance Service spokesman said: “On arrival, ambulance staff found two cars that had been involved in a collision. “The driver of one car, a woman reported to be in her early 40s, was trapped in her vehicle and was suffering from a number of different injuries. “Once she had been cut free, ambulance staff immobilised her with a neck collar and spinal board and continued to treat her for a suspected fractured femur as well as back and chest injuries. “She was then conveyed to University Hospital Coventry and Warwickshire, a major trauma centre, for further assessment and treatment. What happens when you dial 999 for an ambulance? Today, you can follow the exploits of Jess in our Emergency Operations Centre on Twitter as she takes 999 calls. At the same time, she’ll be joined by colleagues from North West and East of England Ambulance Services. You can follow all three by following @OFFICIALWMAS or #team999 now. Between the three services we’ll take the best part of 9,000 calls during the day. Alternatively follow Jess and the others via the BBC Winter Watch facebook page https://www.facebook.com/events/1406296959631316/?ref=22. Here’s a short clip of Jess taking a 999 call with Press Officer Chris Kowalik tweeting beside her. Monday 17th March 2014 – 2.45pm – Claire Brown. A police motorcyclist has been injured in a road traffic collision in Coventry today. West Midlands Ambulance Service was called to reports of a collision involving a police motorcyclist and a car at the junction of Radford Road and Beake Avenue in Coventry at around 1.15pm this afternoon (Monday). An ambulance, a paramedic area support officer and the Warwickshire and Northamptonshire Air Ambulance with a doctor on board attended the scene. The helicopter landed in a nearby park. A West Midlands Ambulance Service spokeswoman said: “Ambulance crews arrived to find the police motorcyclist, a 42-year-old man, trapped between his motorcycle and a car following the collision. The officer had initially been knocked unconscious in the collision. “Ambulance crews and the doctor began assessing the police officer, who had regained consciousness, and found he had sustained an arm injury, suspected leg injuries and a suspected head injury. The officer was given pain relief by ambulance crews before they worked with the fire service to extricate him from between the two vehicles. “After about 40 minutes, the police officer was released and immobilised with a neck collar and spinal board before being taken by land ambulance to University Hospital Coventry and Warwickshire, a major trauma centre, for further treatment. The doctor travelled in the ambulance to continue treatment en route. West Midlands Police are keen to hear from any witnesses to the collision and anyone with information should call the Force Traffic Unit on 101. Monday 17th March 2014 – 10.15am – Murray MacGregor. Staff from West Midlands Ambulance service are set to appear in a dramatic and often heart wrenching three part television documentary series about the care of some of the most seriously ill and injured patients they deal with. ‘An Hour To Save Your Life’, which has been showing on BBC 2, explores in forensic detail the dilemmas and innovations at the frontline of emergency medicine. Following the lead clinicians as they respond to the most critical of cases, the series will offer a unique insight into the minute-by-minute decisions that are made in the fight for life. The moment an emergency call is made, a clock starts ticking. The expert medical attention a patient receives in this first hour is critical and could mean the difference between life or death. Where once an ambulance took a patient to the nearest hospital, now the fight to save lives begins at the roadside, with specialist doctors and ambulance staff working together to undertake complex procedures at the scene. The more quickly they can act, the higher the patient’s chances of survival. The series looks at patients with critical trauma injuries, new treatments around heart attacks and cardiac arrests as well as stroke care. The programme, which airs tomorrow Tuesday 18th March at 9.00pm, will feature a motorcyclist who was critically injured in Shropshire and a Stroke patient in Birmingham. WMAS Medical Director, Dr Andy Carson, said: “What these cases demonstrate is the incredibly high level of care that is now available throughout the West Midlands. We are fortunate to have a world leading trauma initiative in MERIT (Major Emergency Response Intervention Team) operating in the region. This means that there is a highly skilled trauma doctor available to respond to incidents day and night either on an air ambulance or a unique response vehicle. Monday 17th March 2014 – 6am – Steve Parry. West Midlands Ambulance Service was called to the incident at the junction of Lichfield Road and Priory Road at 7.15pm. Three ambulances; a paramedic in a rapid response vehicle and a paramedic officer attended the scene. 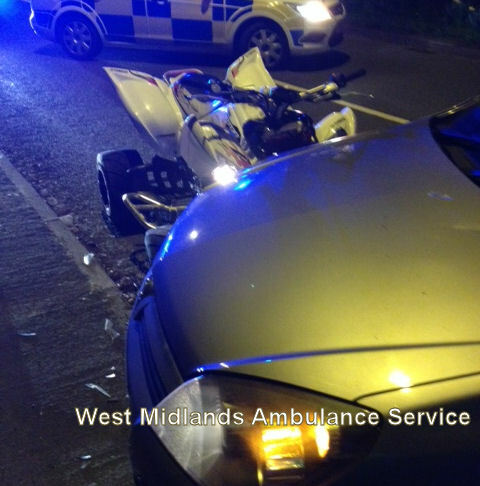 A West Midlands Ambulance Service spokesman said: “Crews responded to a collision between a car and quad bike. They treated two men in their twenties from the bike. “The first casualty was thrown from his machine and received serious pelvic, leg and chest injuries. He was immobilised with the use of a neck collar, leg splint and spinal board and given pain relief before being taken to hospital. “The passenger received arm and wrist injuries. Both patients were taken to the University Hospital of North Staffordshire for further assessment and treatment. Sunday 16th March 2014 – 5.40pm – Steve Parry. 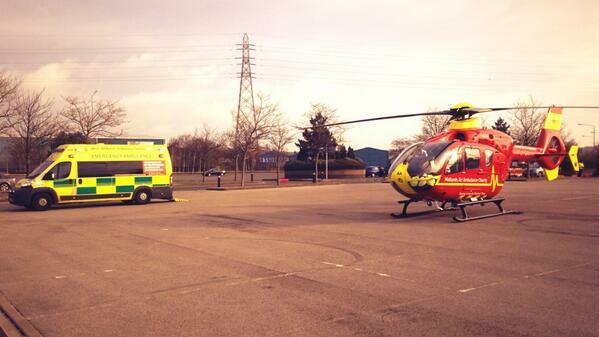 Ambulance crews treated a teenager injured at a motorbike event in Stourport this afternoon. West Midlands Ambulance Service was called to the event near to Ribbersford Road, shortly before 3.50pm. A paramedic in a rapid response car and the Midlands Air Ambulance from Cosford were dispatched to the scene. A West Midlands Ambulance Service spokesman said: “Crews arrived to find a male teenager had become injured after falling from his motorbike. “The casualty was treated for serious head and arm injuries. He was anesthetised by a doctor before being immobilised and airlifted to the Queen Elizabeth Hospital in Birmingham. Sunday 16th March 2014 –5.30pm – Steve Parry. West Midlands Ambulance service can confirm it attended an incident at the Arrow Valley Countryside Centre near Redditch this afternoon. Three teenage boys were reportedly in difficulty in a lake at the park and a call was made to the emergency services at approximately 12.20pm. An ambulance crew, together with a responder paramedic; the Hazardous Area Response Team; MERIT and Midlands Air Ambulance from Cosford were sent to the scene. A West Midlands Ambulance Service spokesman said: “Two teenage boys were recovered from the water and treated for minor injuries by ambulance staff. They were later discharged to the care of parents at the scene. The specialist HART team were in wet suits and joined other emergency services in a search of the water for nearly two hours. A third teenager was eventually located and brought to safety where medics commenced immediate resuscitation and advance life support. 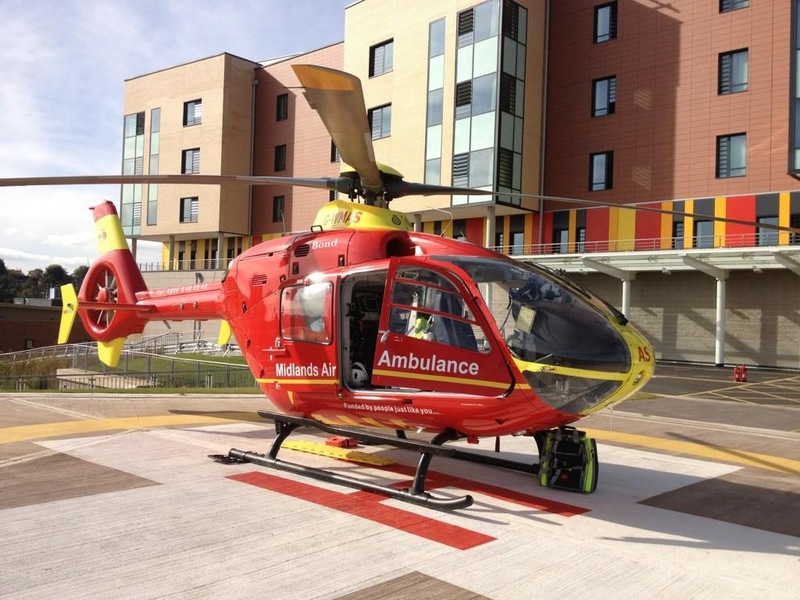 “The patient was taken by ambulance to Alexandra Hospital in Redditch. “The hospital was alerted to the serious condition of the patient. A MERIT doctor travelled to the hospital with the patient and Crew. Sunday 16th March 2014 – 12.30pm – Steve Parry. 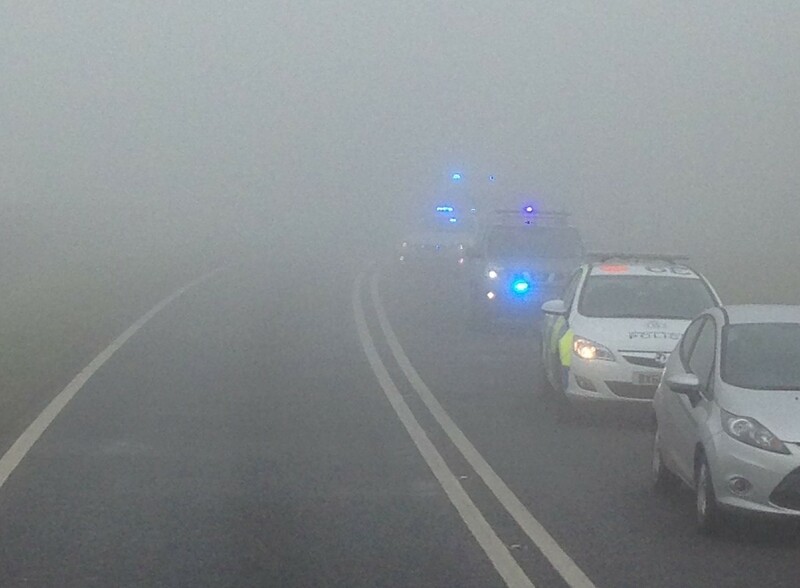 A person has died in a road traffic collision on the M6 earlier this morning. West Midlands Ambulance Service was called to the M6 southbound, near junction 10, at approximately 6.30am. 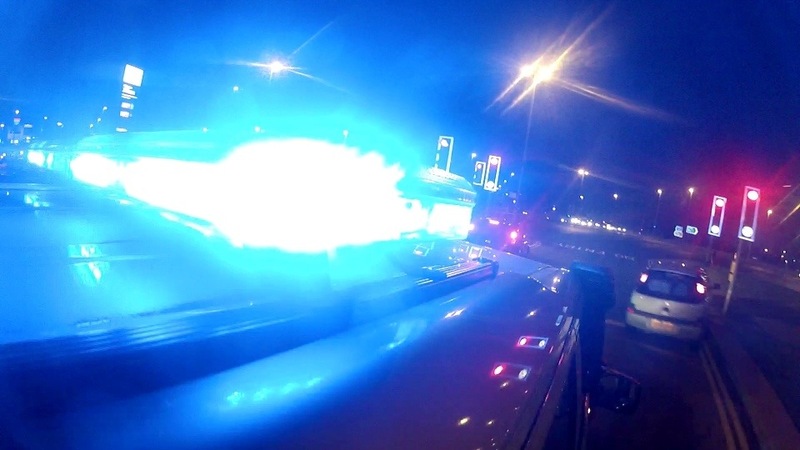 Two ambulances attended the scene together with a paramedic officer and the MERIT team..
A West Midlands Ambulance Service spokesman said: “Crews attended a road traffic collision between a lorry and car. Two men have been taken to hospital following a road traffic collision in Telford this evening. West Midlands Ambulance Service was called to Great Hay Road, Sutton Hill, at just before 9.10pm. Two ambulances; a paramedic in a rapid response vehicle and the Medical Emergency Response Incident Team (MERIT) were sent to the scene. A West Midlands Ambulance Service spokesman said: “Ambulance crews responded to a road traffic collision following reports of a car leaving the road and going down an embankment. “A man in his twenties managed to free himself from the car and was treated for back pain. He was immobilised with the use of a neck collar and spinal board before being conveyed to the Royal Shrewsbury Hospital. “A second man, believed to be in his twenties and a passenger in the car, was treated for head injuries. The patient was anesthetised by a trauma doctor at the scene before being taken to the University Hospital of North Staffordshire. Saturday 15th March 2014 – 10.30pm – Steve Parry. A man has died following a road traffic collision in Darlaston this afternoon. West Midlands Ambulance Service was called to Old Park Road at approximately 6.15pm. An ambulance, paramedic officer, a paramedic in a rapid response car and the Midlands Air Ambulance medical team responding in a car were sent to the scene. 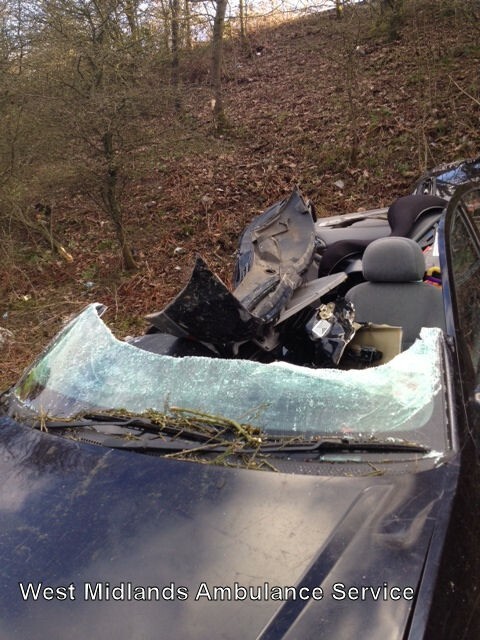 A West Midlands Ambulance Service spokesman said: “Crews attended a single vehicle incident. Saturday 15th March 2014 – 6.30pm – Steve Parry. Four people have been taken to hospital following a road traffic collision near Leamington this afternoon. West Midlands Ambulance Service was called to the junction of Harbury Lane and Fosse Way, Chesterton near Leamington, at just after 4pm. Two ambulances and a paramedic officer in a rapid response vehicle were sent to the scene. A West Midlands Ambulance Service spokesman said: “Ambulance crews responded to a road traffic collision involving two cars. “A child, believed to be eleven years old, received facial injuries. Two men in their twenties and sixties were treated for minor injuries. “A woman in her fifties and travelling in the second car involved was treated for a hip injury. Saturday 15th March 2014 – 6.30am – Steve Parry. A pedestrian has been taken to hospital following a road traffic collision in Pershore last night. The incident occurred on the B4080 Worcester Road, just before 10.50pm. An ambulance crew; a paramedic officer; a paramedic in a rapid response car together with the Medical Emergency Response Incident Team (MERIT) treated the patient. “A man, believed to be in his fifties, was treated for serious head and internal injuries. “The patient was anaesthetised by a doctor and immobilised with the use of a neck collar and placed on a spinal board before being conveyed to the Queen Elizabeth Hospital in Birmingham. Thursday 13th March 2014 – 5.15pm – Murray MacGregor. At times of adversity, the British population pulls together. 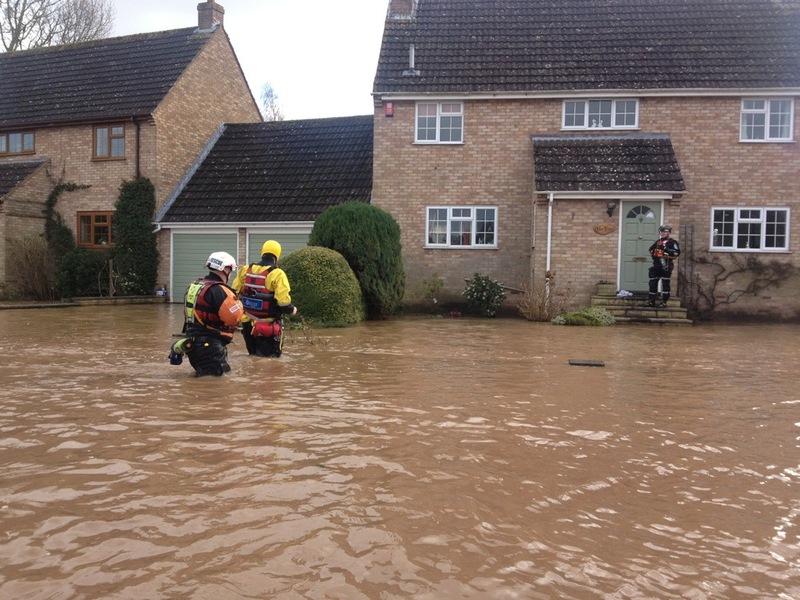 It was no different for ambulance services when there was a request for mutual aid from South Western Ambulance Service to help deal with the extraordinary scenes on the Somerset Levels. West Midlands Ambulance Service, like all English Ambulance Trusts, agreed to provide additional staff to work in the flood affected area, which covers around 25 square miles. They joined colleagues from South Western Ambulance who have been providing teams of specialist paramedics, 24 hours a day, ready to deploy into the devastated areas to provide medical help at a moment’s notice. The staff, who are all part of the Hazardous Area Response Team (HART), are trained to operate in challenging conditions such as fast flowing water and can use their skills to rescue people from dangerous situations despite being in need of medical assistance. Earlier this month, the other nine ambulance Trusts agreed to provide teams of two HART trained paramedics 24 hours a day to assist South Western Ambulance Service. 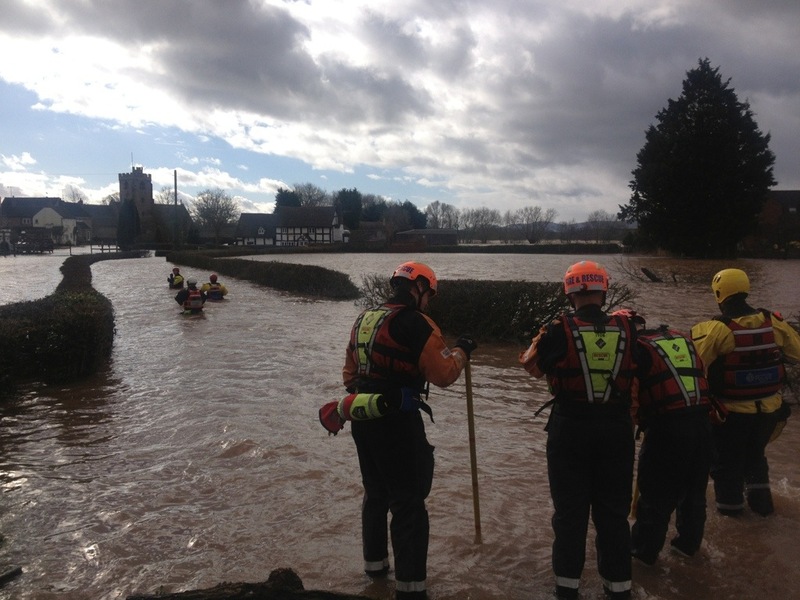 West Midlands HART Support Manager John Woodhall, who is a water rescue specialist, said: “When we were asked to provide assistance, every one of our staff volunteered to help out. Over the last two weeks, HART staff from all over the country have been assisting. “The team of two we sent down said that although much of the water had receded, the level of destruction they witnessed was appalling. Entire communities had been devastated. “Every member of HART, wherever they came from in the country, was pleased to be able to offer their time to try and help out in any way they could whether simply carrying out welfare checks or dealing with people in need of medical assistance. After 10 days of assistance (3rd – 13th March), the mutual aid has been stood down now that the flood waters have started to recede. Martin Flaherty, Managing Director of the Association of Ambulance Chief Executives added: “Within hours of the request being made, staff were en route to the South West using national assets so that local services would not be affected. The whole operation was co-ordinated at the National Ambulance Coordination Centre (NACC) which is based at London Ambulance Service Headquarters. “Because all of the HART teams are trained nationally and use standard equipment, it made no difference where the HART paramedic came from. 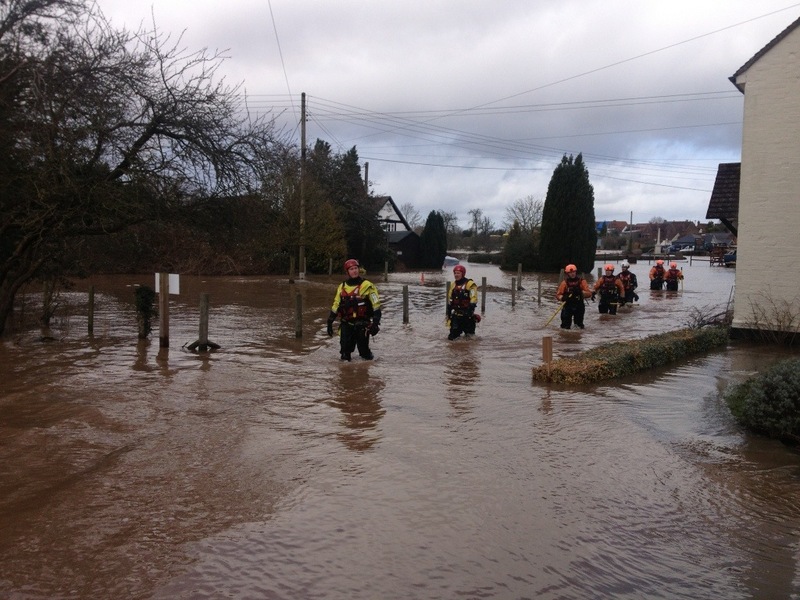 The above pictures are examples of ambulance HART staff working with police and fire colleagues in Worcestershire but illustrate the sort of conditions being experienced in the Somerset Levels. 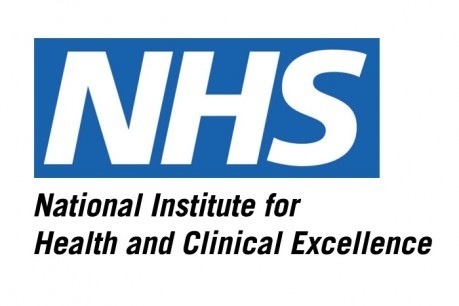 We have been contacted colleagues in the East Midlands about a patient who received a text message purporting to be from NICE (National Institute for Health and Care Excellence). The message stated that after some further analysis, the blood test that the patient had recently had showed signs that she had possible cancer and attached a table of the results. It is believed that the file can do damage to the phone / computer or strip out personal details. It also said to contact your GP. Thursday 13th March 2014 – 1.00pm – Claire Brown. 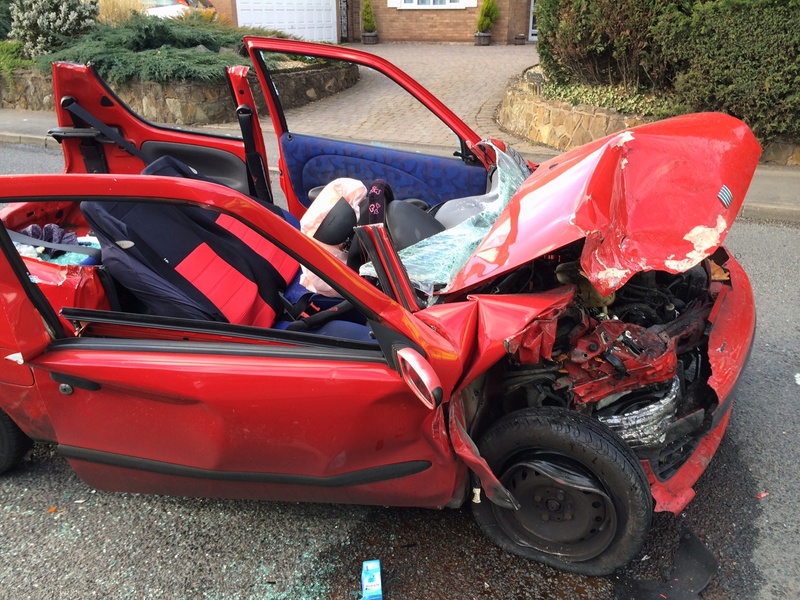 A woman, who was trapped in wreckage for over an hour, received ongoing treatment by ambulance staff as they worked with the fire service to extricate her following a collision in Staffordshire this morning. West Midlands Ambulance Service was called to the junction of the A515 and B5234 in Newborough, Burton-on-Trent at 9.15am today (Thursday). Two ambulances, a paramedic area support officer and a response car from the Midlands Air Ambulance base in Staffordshire responded to the incident. A West Midlands Ambulance Service spokeswoman said: “Upon arrival, the emergency services found two cars which had been involved in a collision. Both cars sustained significant front end damage. “The driver of one car, a 38 year old man, was out of his vehicle. Ambulance crews assessed the man and found he had sustained neck pain in the collision. He was immobilised with a neck collar and spinal board before being taken to Queen’s Hospital Burton. “The driver of the second car, a 45 year old woman, was mechanically trapped in the wreckage. Ambulance staff assessed the woman whilst in the car and found she had suffered arm, chest and hip pain. Once they had administered pain relief to the woman, ambulance staff worked closely with the fire service to carefully extricate her from the car. Thursday 13th March 2014 – 12.45pm – Suzie Fothergill. Sir Keith Pearson, Chair of Health Education England and Jenni Ord, Chair for Health Education West Midlands have praised the staff developments that are being undertaken by West Midlands Ambulance Service. The pair visited ambulance headquarters yesterday (Wednesday) to hear about the wide variety of programmes being undertaken by the Trust. During the visit, they received an overview of the educational systems that are embedded into the Trust, such as paramedic progression and apprenticeships. 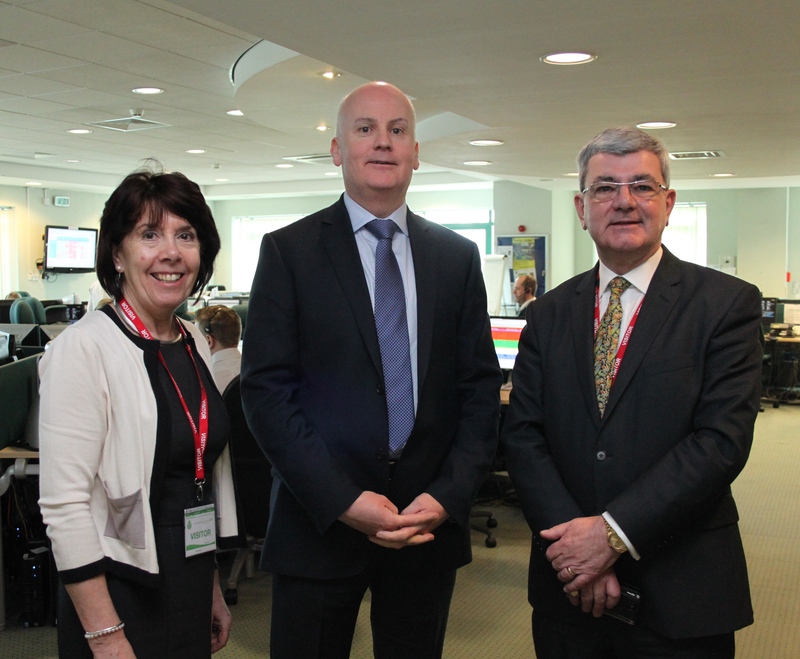 They also met WMAS Chief Executive, Anthony Marsh and a range of other Trust staff involved in the developments. Key to the presentations were the way the Trust has invested heavily in helping staff to train to higher levels of education which ultimately allow the individuals to provide better patient care. For example, they heard about the additional skills paramedics have which means many more patients are now cared for within their own homes rather than needing to be taken to hospital as might have happened only five years ago. During the visit, Sir Keith remarked how impressed he was with what was going on within the organisation, as well as the contribution that WMAS has made to the improvements in Ambulance Services across the country. The day was rounded off with a tour of the Emergency Operations Centre. Wednesday 12th March 2014 – 9.20pm – Steve Parry. A mountain biker has been taken to hospital after coming off his cycle in a wooded area near Little Ness in Shropshire this evening. West Midlands Ambulance Service was called to a location near Valeswood Lane, Little Ness at 7.15pm. An ambulance, together with a paramedic officer in a rapid response vehicle and the Hazardous Area Response Team (HART) attended the scene. 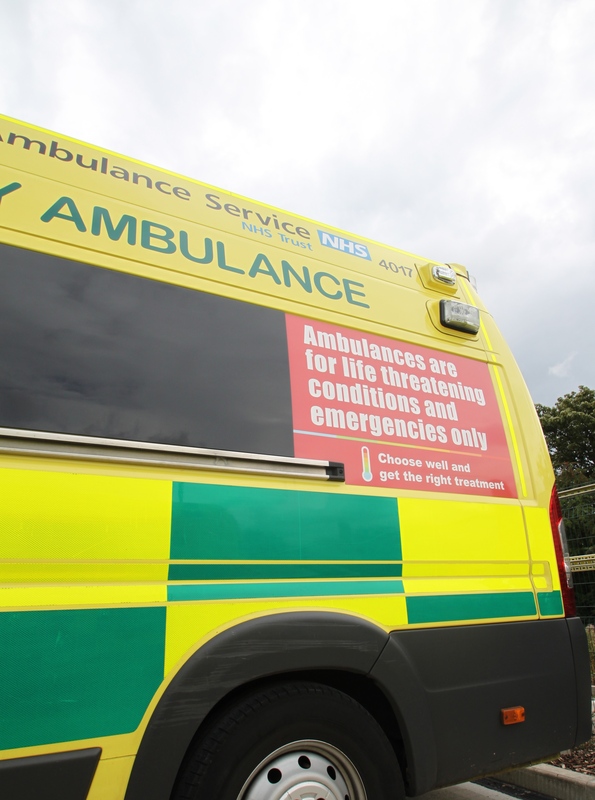 A West Midlands Ambulance Service spokesman said: “Crews responded to an incident following reports that a mountain biker had fallen down an embankment in wooded terrain near Little Ness. “Crews worked in diminishing light for over two hours to locate and treat the patient. The man, believed to be in his forties, was treated for neck, leg and arm injuries. The patient was immobilised with the use of a neck collar and spinal board before being brought down a track to safety.